Today, I bring you the motherlode of flash technology…in my opinion, the reason flash was meant to exist. (Okay, not really, but it’s really cool!) Virtual NES! Being the last day of Flash Week, I thought it would be good to go out on a bang, and give you the opportunity to not only play just one game, but over 100 games, all released on the Nintendo Entertainment System we know and love. Some games are a little buggy, but it’s a great way to enjoy your old favorites (and try some games that you never heard of before) from any browser, anywhere. So thanks for following me during the first Flash Week of 2009, and I’m already looking forward to the next! This one’s a little different. It’s a great use of Atari-style graphics and using the minimalist nature to focus on the gameplay and the “story”. This one is an artistic masterpiece, in my opinion. Give it a try, all the way to the end. (Took me, about 10 minutes, tops.) 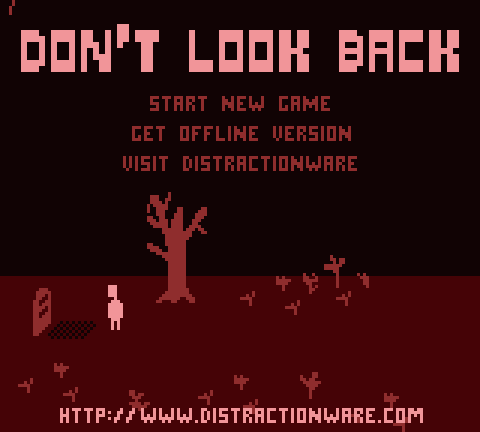 “Don’t Look Back” is an excellent use of the medium! I’ve written about Auditorium by Cipher Prime, LLC before, but as the game is now fully complete and can be purchased, I highly recommend you check it out again. The demo is still the same as before, and the gameplay is still wonderfully puzzle-y. The soundtrack is the star of this game, and really makes for a relaxing experience. The basic idea is that you’re altering a flow of energy to feed a number of individual instruments and themes, that when completed, create a complete, orchestral whole. If that’s confusing, then you simply have to play it to experience it! The game can be difficult at times due to the great later-stage puzzles but overall, it’s never overwhelming due to the knowledge that given enough time, you can always solve everything through strategic placement of the “controls” and that many puzzles have multiple ways that they can be solved. If you haven’t checked it out before, you would definitely be doing yourself a disservice not to do so now. Check out Auditorium! Week of Flash Continues – Blush! 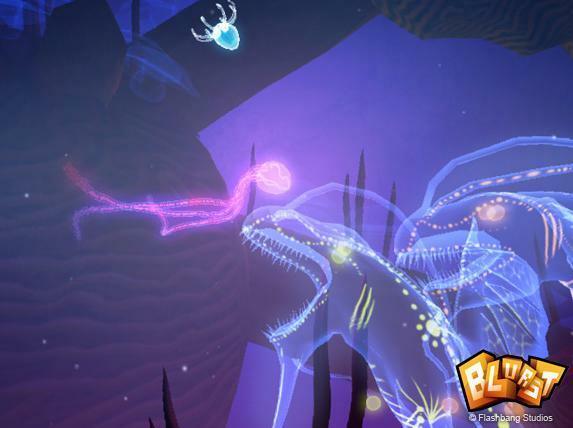 Blush has beautiful graphics and gameplay, especially for a browser game! Continuing with the creepy theme (unintentionally, I assure you), I bring you another flash game, entitled “Blush“. This game is excellent, and definitely has a “Flow” vibe to it. Another thing unique about this game is that it uses the “Unity Engine” which is a small web-based graphics client that you install (completely safe, I assure you) and allows you to get some amazing graphic fidelity in a typical broadband connection. (The technology is also being used in the highly acclaimed browser MMO from Cartoon Network, “Fusion Fall”.) The graphics here are beautiful and the gameplay is simple, yet challenging. Highly recommended, give Blush a try! No, not that kind of flash, you perverts!!! Browser-based games! Since it’s been a while since I’ve updated my “Humpday Flash” posts, I figured I’d highlight a game every day of this week for your freeloading gaming pleasure. I present thee with Battalion: Nemesis! It’s a strategy RPG (in the hex-based tradition) with land, air and sea units available to you. 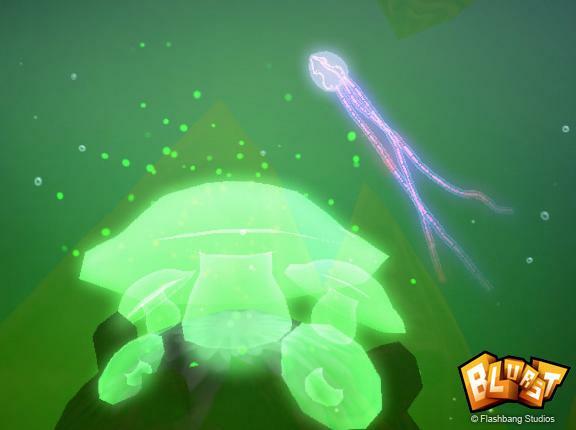 While it’s complex for a flash game, it’s more of a time-sink than a truly deep game. It’s definitely fun, (and the dialogue is snarky and pokes fun at the genre) but the latter stages are really more wars of attrition than actual strategy sessions. But overall, a great game for free and one I’d recommend checking out, to be sure. Enjoy!